Weleda asked midwives to advise on the perfect moisturising lotion, and they helped choose the most delicate formula Weleda has ever made. Organic white mallow extract wraps baby in a cooling protective layer, kind-hearted pansy extract soothes irritation, and organic coconut and sesame oils nurture the skin. Helping to relieve itchiness, this fragrance free body lotion provides a pleasant cooling sensation on the skin. 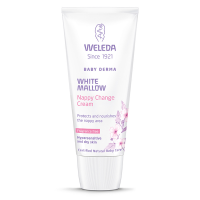 Thanks to carefully selected natural ingredients Weleda White Mallow Body Lotion has a pleasant, mild scent without essential oils. 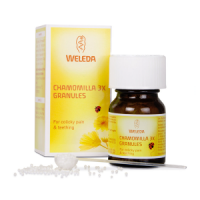 For delicate skin that needs cosseting – especially in a family who already know sensitivity and allergy. INCI: Water (Aqua), Cocos Nucifera (Coconut) Oil, Sesamum Indicum (Sesame) Seed Oil, Glycerin, Alcohol, Cetearyl Glucoside, Beeswax (Cera Alba), Hydrogenated Coco- Glycerides, Theobroma Cacao (Cocoa) Seed Butter, Borago Officinalis Seed Oil, Carthamus Tinctorius (Safflower) Seed Oil, Helianthus Annuus (Sunflower) Seed Oil Unsaponifiables, Glyceryl Stearate SE, Prunus Amygdalus Dulcis (Sweet Almond) Oil, Althaea Officinalis (White Mallow) Root Extract, Viola Tricolor (Pansy) Extract, Xanthan Gum, Glyceryl Caprylate, Squalene.